Oof – this hot weather in London has been lovely. And I have craved cold soups like nobody’s business, because the thought of heating up the oven or stove has been too much in the muggy heat. I have always been a bit obsessed with the Spanish cold soup, gazpacho, and thought I’d include two recipes below – one using the traditional tomato as its base, and the other made with roasted beetroot. 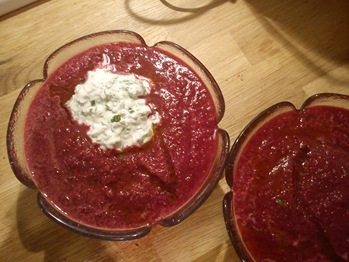 Peel the beetroots, chop into small chunks and spread out into one thin layer in an oven dish. Toss them in oil and a bit of salt, then tightly cover the dish with aluminium foil and roast in an oven for 1 to 1.5 hours at 200C, or until tender and you can pierce easily with a knife. Set aside the beetroot to cool down completely. Take a large mixing bowl, chop all the remaining vegetables up into chunks, roughly chop the flatleaf parsley and chuck everything into the bowl. Add the vinegar and oil, then pulverise to a puree with a hand/stick blender – add some water if you need to loosen up the texture. The resulting mixture should be quite thick. Season to taste and chill in the fridge overnight, then just before eating, remove from the fridge, season to taste again (add a bit more vinegar if you like) and put into bowls. Finely chop the mint, mix into the Greek yoghurt, and add a dollop of the herby mixture on top of the soup. Really nice served with some grilled halloumi cheese and toasted rustic bread slathered in olive oil – the sweetness of the beetroot and the saltiness of the cheese is amazing. Take a large mixing bowl. Chop all the vegetables up into dice. Chuck them into the bowl, add the oil, and add 3 tablespoons of the vinegar, then add half the water. Take a hand blender (stick blender) and plunge it into the veg – whiz everything up into a thick soup, which you want to remain a little rough in texture – it’s nice as a rustic soup. Keep adding water as you go, depending on how watery some of the veg are, you might not need all 600ml. Taste – add the remaining 3 tablespoons of vinegar if you want it to be a bit zingier. Season to taste with salt and pepper. Chill overnight in the fridge – this allows all the flavours to develop. The next day, just before serving, remove it from the fridge and taste it – if it needs a bit more vinegar or seasoning, add it in now. Serve chilled and enjoy – just don’t breathe on anyone immediately afterwards unless they have been eating the same soup too, it’s pretty ‘phwoar’ garlicky! Blog mention = "inner circle". I feel like a celeb! I will definitely be making the gazpacho. Cold soup is also a brilliant idea for those with newborns as babies tend to need attention the minute a piping hot soup hits the table. But Pip, you ARE a celebrity! At least in my world ;o) Cold soups are such a winner – v safe to eat around tiny people aren't they!